The Nrf2 transcription factor is well known for its cytoprotective functions through regulation of genes involved in the detoxification of reactive oxygen species or toxic compounds. Therefore, activation of Nrf2 is a promising strategy for the protection of tissues from various types of insults and for cancer prevention. However, recent studies revealed a proinflammatory activity of activated Nrf2 and a stimulating effect on epithelial cell proliferation, but the underlying mechanisms of action and the responsible target genes are largely unknown. Using a combination of gene expression profiling, chromatin immunoprecipitation, and targeted proteomics via selected reaction monitoring, we show that the gene encoding the proinflammatory cytokine IL-36γ is a novel direct target of Nrf2 in keratinocytes and hepatocytes in vitro and in vivo. As a consequence, upregulation of IL-36γ expression occurred upon genetic or pharmacological activation of Nrf2 in the epidermis and in the normal and regenerating liver. Functional in vitro studies demonstrate that IL-36γ directly stimulates proliferation of keratinocytes. 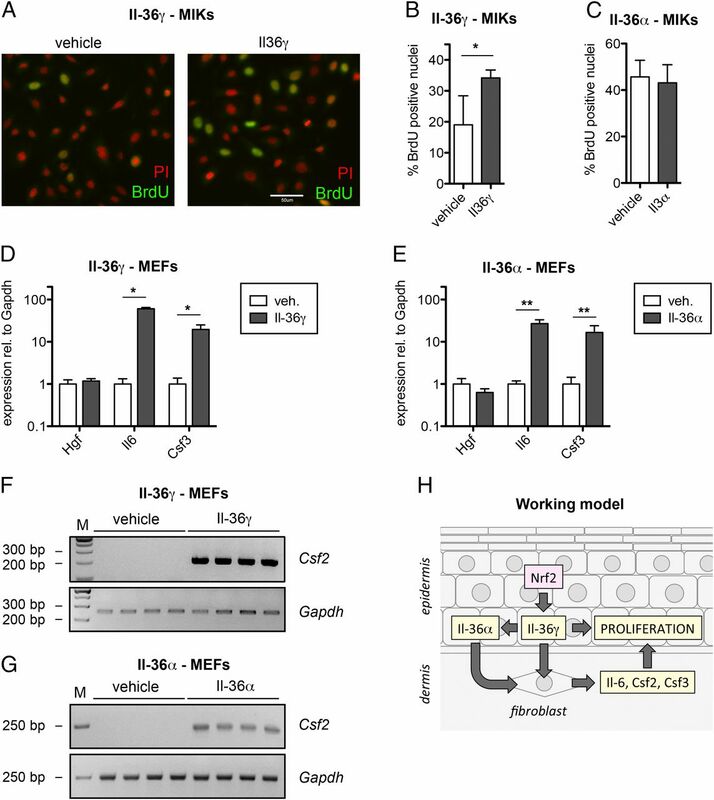 In particular, it induces expression of keratinocyte mitogens in fibroblasts, suggesting that the Nrf2–IL-36γ axis promotes keratinocyte proliferation through a double paracrine loop. These results provide mechanistic insight into Nrf2 action in the control of inflammation and cell proliferation through regulation of a proinflammatory cytokine with a key function in various inflammatory diseases. The transcription factor NF erythroid derived 2, like 2 (Nrf2) is a master regulator of the cellular stress response through the activation of genes involved in the detoxification of various compounds and of reactive oxygen species (ROS) (1). This important function is reflected by the phenotype of Nrf2-knockout (Nrf2ko) mice, which are highly susceptible to treatment with different toxins and to cancer development in various tissues and organs (2). Under homeostatic conditions, Nrf2 is retained in the cytoplasm through binding to the inhibitory protein kelch-like ECH-associated protein 1 (Keap1), which also mediates its ubiquitination and subsequent proteasomal degradation. However, this inhibition is not complete, and low amounts of Nrf2 can translocate to the nucleus and bind to antioxidant response elements (AREs) in promoter or enhancer regions, resulting in a basal expression of most Nrf2 target genes. In response to electrophiles and under certain circumstances in response to ROS directly, the Nrf2–Keap1 interaction is weakened, leading to stabilization of Nrf2 and translocation of newly synthesized Nrf2 protein to the nucleus (2). This enhances expression of Nrf2 target genes and initiates a cytoprotective response. Therefore, Nrf2-activating compounds are in preclinical and clinical studies for protection from neurodegenerative disease and for cancer prevention (2). However, recent studies uncovered severe negative effects of excessive Nrf2 activation. In particular, NRF2-activating mutations or KEAP1-inactivating mutations are a hallmark of different malignancies. This causes enhanced drug resistance, increased survival under stress conditions, and hyperproliferation of the tumor cells as a result of an increased abundance of multidrug-resistance proteins, ROS-detoxifying enzymes, and metabolic enzymes (2, 3). Recent studies from our laboratory also demonstrated that chronic activation of Nrf2 in keratinocytes causes hyperkeratosis, epidermal thickening due to keratinocyte hyperproliferation, cutaneous inflammation, and sebocyte hyperplasia (4–6). Therefore, we searched for soluble mediators that are controlled by Nrf2 and may affect cell proliferation and/or inflammation. We identified IL-36γ (formerly designated IL-1 family member 9 [IL-1f9]) as a novel direct target of Nrf2 and show the importance of its regulation for keratinocyte growth control. Animal maintenance and experiments with animals were approved by the local veterinary authorities of Zurich. 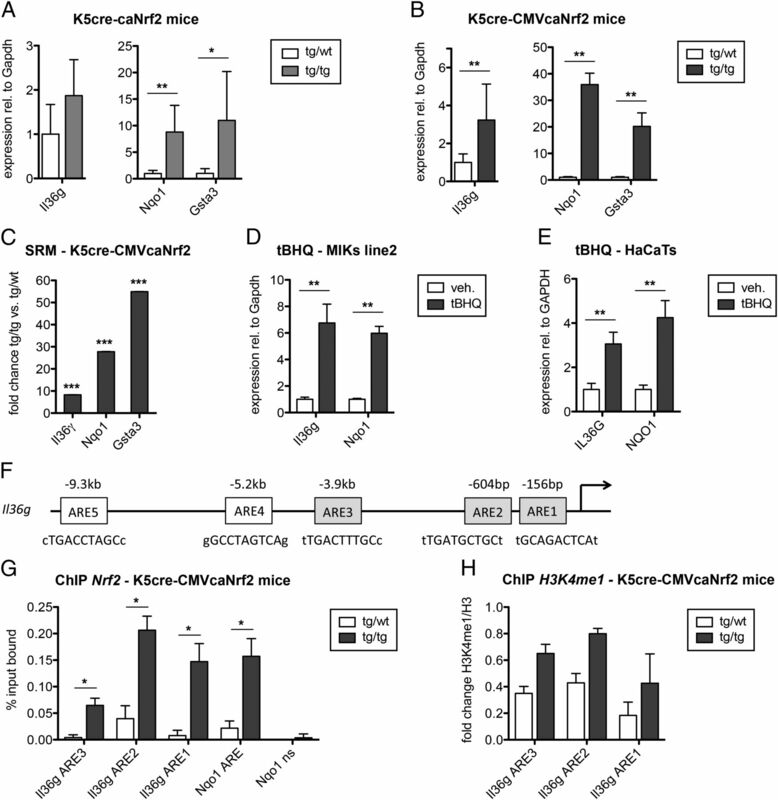 K5cre-caNrf2 mice, K5cre-CMVcaNrf2 mice, and Albcre-caNrf2 mice (C57BL/6/FVB F1 genetic background), as well as Nrf2ko mice (C57BL/6 genetic background) or mice expressing a dominant-negative Nrf2 mutant in keratinocytes (K14-dnNrf2 mice; FVB genetic background) were described previously (4, 5, 7–9). Two thirds (partial) hepatectomy was performed as previously described (10). The regenerating liver was removed at different time points after partial hepatectomy (PH). The liver tissue resected during PH was considered the 0-h time point. Murine primary keratinocytes (MPKs) were isolated from newborn mice, as previously described (4). MPKs and murine immortalized keratinocytes (MIKs) were cultured in defined keratinocyte-serum free medium (Life Technologies, Zug, Switzerland). Mouse embryonic fibroblasts (MEFs) and HaCaT cells were cultured in DMEM supplemented with penicillin/streptomycin and 10% FCS. They were treated with 50 or 500 μM tert-butylhydroquinone (tBHQ; Sigma, Buchs, Switzerland) for 1, 6, 12 or 24 h or with 5.8 nM murine truncated rIL-36γ or rIL-36α (both from R&D Systems, Minneapolis, MN) for 6 h, according to the manufacturer’s instructions. BrdU labeling was performed by incubation of cultured cells in 100 μM BrdU (Roche, Rotkreuz, Switzerland) for 2 h. Cells were fixed with 4% paraformaldehyde, and BrdU was detected by immunofluorescence analysis, as described previously (11). Total cellular RNA isolation, purification using the MinElute Kit (QIAGEN, Hilden, Germany), cDNA synthesis, and quantitative RT-PCR (qRT-PCR) were described previously (6). Primers used are listed in Table I.
Chromatin immunoprecipitation (ChIP) was performed as previously described (12). Chromatin was precleared with nonspecific IgG and incubated overnight with Abs against Nrf2 (Santa Cruz Biotechnology, Santa Cruz, CA), histone H3 (Abcam, Cambridge, U.K.), histone H3 monomethyl Lys4 (H3K4me1; Active Motif, Carlsbad, CA), or normal rabbit IgG (Millipore, Billerica, MA). The percentage of the input that was bound was calculated by the ΔCt method and averaged over at least three experiments. H3K4me1 occupancy was calculated as fold change over total histone H3 occupancy, and ChIP was repeated at least three times. Epidermis was homogenized and sonicated in 8 M urea, 100 mM ammonium bicarbonate buffer containing complete protease inhibitors (Roche). Soluble proteins were separated from insoluble material by two rounds of high-speed centrifugation. Selected reaction monitoring (SRM) measurements were essentially performed as described (13). For this purpose, 20 μg epidermal protein extract was reduced with 5 mM TCEP for 30 min and alkylated with 40 mM IAA at room temperature. Subsequently, the extract was adjusted to 6 M urea by adding 50 mM NH4CO3. For the primary digestion step, 0.2 μg Lys-C (Wako Pure Chemicals, Osaka, Japan) was added (protein/Lys-C ratio = 100:1) and incubated for 4 h at 37°C. After further diluting the extract to 1.5 M urea, 0.5 μg trypsin (Promega, Madison, WI) was added (protein/trypsin ratio = 50:1) and incubated at 37°C overnight. Resulting peptides were desalted on C18 StageTips, as described (14). For SRM assay development, tryptic peptides were analyzed in data-dependent analysis mode on a TripleTOF 5600 (AB Sciex, Concord, ON, Canada) connected to a nano liquid chromatography system (Eksigent NanoLC Ultra 1D plus; AB Sciex Switzerland GmbH, Zug, Switzerland). Acquired fragment ion spectra were matched against the current mouse Uniprot reference proteome using the Mascot search engine (Matrix Science) and the following search parameters: tryptic enzyme specificity and zero missed cleavages; fixed modifications: carbamidomethyl cysteine; variable modifications: methionine oxidation; 20-ppm peptide tolerance; 0.5-Da tandem mass spectrometry tolerance. Mascot search results were converted to a spectral library using the BiblioSpec implementation in Skyline (15). In addition, we converted empirical retention times into iRT scores following the procedure described by Escher et al. (16). For each target protein we selected three unique peptide precursors present in the spectral library and their most intense (top3) fragment ions from the y and b ion series. Fragment ions within a 5-Da window centered around the precursor mass were excluded. The preliminary assays were tested on a QTRAP 5500 operated in-line with an Eksigent nanoLC Ultra 1D plus (both from AB Sciex) in scheduled SRM mode applying iRT calibration. Optimal collision energy and declustering potential for each target were predicted by linear regression. Q1 and Q3 were operated at unit resolution during data acquisition. We separated peptides using a linear gradient from 1 to 35% buffer B over 57.5 min at a constant flow rate of 300 nl/min. Buffer A: 0.1% formamide in water; Buffer B: 0.1% formamide in acetonitrile. Separated peptides were electrosprayed into the mass spectrometer via a 10-μm inner-diameter spray tip (PicoTip emitter, New Objective; MS Wil, Wil, Switzerland). The column was maintained at 50°C using a column heater (MS Wil). Fused silica columns (75 μm inner diameter × 150 mm) were made in-house and packed with ReproSil-Pur 1.9-μm C18 reverse-phase material (Dr. Maisch, Ammerbuch-Entringen, Germany). For protein quantification we chose the two assays resulting in the highest overall signal intensity. IL-36γ–specific SRM assays were developed by digesting 1 μg recombinant protein (R&D Systems), followed by peptide cleanup and data-dependent analysis, as outlined above. For each IL-36γ peptide detected in the shotgun analysis, we selected the most intense (top5) transitions from the y and b ion series, again excluding a 5-Da window around the precursor mass. All selected transitions were further tested in an unscheduled SRM experiment (fixed 20 ms dwell time/transition). Based on SRM signal intensity, we selected the top three-ranked transitions/peptide to be included in the final assays. We quantified protein levels by scheduled SRM, monitoring a 5-min window around the expected retention time, as predicted by iRT calibration. The mass spectrometry duty cycle was fixed at 3 s, taking care not to exceed 150 concurrent transitions during data recording (thereby assuring a minimum dwell time of 20 ms/transition and 7–10 data points across a typical chromatographic peak). In addition to IL-36γ, NAD(P)H dehydrogenase quinone 1 (Nqo1), and Gsta3, we targeted 29 housekeeping proteins showing no differential abundance upon constitutively active Nrf2 mutant (caNrf2) overexpression, as analyzed by microarray analysis. To control correct peak group selection, we added one synthetic decoy transition for each target transition (calculated by the random mass shift method). Peak group selection and signal integration were done in Skyline after fitting an mProphet model (17) to the acquired data. False-negative peak groups were inferred using the data acquired for decoy transitions. We suppressed peak area integration for peak groups with a q-value < 0.01, according to the fitted mProphet model. Finally, peak areas were exported to R for further statistical analysis using the MSstats package (18). First, raw peak areas were normalized according to the 29 housekeeping proteins serving as global standard proteins. We then tested for differential protein abundance by linear mixed-effect modeling (restricted scope of biological replication). During fold-change estimation, missing values were handled by imputation. Error bars represent SD. Statistical analysis was performed using the Mann–Whitney U test for non-Gaussian distribution. Significance analysis for SRM data was performed using MSstats (18). To identify Nrf2 target genes encoding soluble mediators that may affect cell proliferation and/or inflammation, we analyzed microarray data obtained from skin of mice expressing low or high levels of caNrf2 in keratinocytes (designated K5cre-caNrf2 and K5cre-CMVcaNrf2 mice) (4, 5). The Affymetrix expression profiling was performed at postnatal day 2.5 before the hyperproliferative and inflammatory phenotype had developed in these mice. Therefore, differentially expressed genes are likely to be direct Nrf2 targets. Interestingly, mRNA levels of IL-36γ, a proinflammatory cytokine of the IL-36 family, were increased in the skin of both mouse lines (Table II). qRT-PCR confirmed a mild, but nonsignificant, upregulation of Il36g in isolated epidermis of adult K5cre-caNrf2 mice and a strong and statistically significant upregulation in K5cre-CMVaNrf2 mice, which correlated with increased expression of the classic Nrf2 target genes Nqo1 and Gsta3 (Fig. 1A, 1B). To validate the Nrf2-dependent increase in abundance of IL-36γ on the protein level, we established specific SRM assays using recombinant mouse IL-36γ. These assays target eight IL-36γ peptides, thereby covering 62% of its primary amino acid sequence (Supplemental Fig. 1). Applying these assays in parallel with SRM assays established for two classic Nrf2 targets, Gsta3 and Nqo1, indicated a significant and almost 10-fold higher IL-36γ protein level in the epidermis of adult K5cre-CMVcaNrf2 mice compared with control animals (Fig. 1C, Supplemental Fig. 2). Pharmacological activation of endogenous Nrf2 by treatment of MIKs with tBHQ or MPKs with sulforaphane also increased the expression of Il36g and Nqo1 (Fig. 1D, Supplemental Fig. 3A–C). A similar effect was seen upon treatment of human HaCaT keratinocytes with tBHQ, demonstrating that IL36G regulation by activated NRF2 is conserved between mice and humans (Fig. 1E). Nrf2 activation in keratinocytes induces expression of IL-36γ. qRT-PCR for Il36g, Nqo1, and Gsta3 relative to Gapdh using epidermal RNA from K5cre control (tg/wt) and K5cre-caNrf2–tg (tg/tg) mice (n = 4–6) (A) or K5cre mice (tg/wt) and K5cre-CMVcaNrf2 (tg/tg) mice (n = 6) (B) at the age of 8 wk. **p = 0.0095 (Nqo1), *p = 0.0361 (Gsta3) (A). **p = 0.0022 (Nqo1), **p = 0.0043 (Il36g, Gsta3) (B). (C) Relative protein abundance of IL-36γ, Nqo1, and Gsta3 in the epidermis of adult K5cre-CMVcaNrf2 mice. Bar graph depicts protein level changes relative to control animals, as measured by SRM (n = 3). ***p < 0.0001. (D) qRT-PCR for Il36g using RNAs from MIKs of wt mice treated with vehicle or 50 μM tBHQ (n = 5–6). **p = 0.0022. (E) qRT-PCR for IL36G using RNAs from HaCaT keratinocytes treated with vehicle or 500 μM tBHQ (n = 6). **p = 0.0043. (F) Location of AREs in the 5′-untranslated region of the mouse Il36g gene. Arrow indicates transcription start site. (G) ChIP showing binding of Nrf2/caNrf2 to ARE1–3 of the Il36g gene [shown in gray in (F)] and to an ARE in the Nqo1 gene in the epidermis of K5cre mice (tg/wt) and K5cre-CMVcaNrf2 mice (tg/tg). Primers spanning a nonspecific (ns) region located 2 kb away from the ARE of the Nqo1 gene were used as negative control (n = 4). *p = 0.0294 (Il36g ARE3, ARE2), *p = 0.0286 (Il36g ARE1, Nqo1 ARE). (H) ChIP using an H3K4me1 Ab and epidermal lysates from K5Cre (tg/wt) and K5Cre-CMVcaNrf2 mice (tg/tg) (n = 3–4). Mean values of control samples were set to 1 in all experiments. In silico analysis of the Il36g gene promoter identified five AREs, of which two (ARE1 and ARE2) are in close proximity to the putative transcriptional start site (Fig. 1F). ChIP using lysates from back epidermis of (wt) mice and an Nrf2 Ab revealed modest binding of Nrf2 to ARE2 in the Il36g promoter and to an ARE in the Nqo1 promoter but not to a nonspecific region in the Nqo1 promoter (Fig. 1G, white bars). However, the basal activity of Nrf2 did not contribute to Il36g expression under normal conditions, because no reduction in Il36g expression was observed in the epidermis of Nrf2ko mice and in MIKs of transgenic (tg) mice expressing a dominant-negative Nrf2 mutant (K14-dnNrf2) (9) (Supplemental Fig. 3D, 3E). Consistent with the increased expression of Il36g in caNrf2-tg mice, ChIP analysis using lysates from K5cre-CMVcaNrf2 mice revealed strong binding of Nrf2/caNrf2 to all three Il36g AREs and to the Nqo1 ARE (Fig. 1G, black bars), and the increase in Nrf2 binding compared with control mice was significant for all AREs. Furthermore, ChIP analysis using an Ab against histone H3K4me1, an epigenetic marker of active promoters (19), showed higher occupancy of H3K4me1 at ARE3 and ARE1 of the Il36g promoter in the epidermis of K5cre-CMVcaNrf2 mice compared with control mice (Fig. 1H). The difference in enrichment of H3K4me1 at the Il36g AREs did not reach statistical significance in K5cre-CMVcaNrf2 mice because of the high levels of H3K4me1 in the upstream region of the Il36g gene. Nevertheless, this finding strongly suggests that binding of caNrf2 to the AREs of the Il36g promoter/enhancer region activates expression of this gene. Expression of another member of the IL-36 family, Il36a, was mildly and nonsignificantly increased in the epidermis of mice with low caNrf2 expression levels. This increase was statistically significant in the mice with strong caNrf2 expression and correlated with increased expression of Il36g, Nqo1, and Gsta3. In contrast, Il36b expression was not regulated, and Il36ra and Il36r mRNA levels were even mildly reduced compared with control mice (Fig. 2A, 2B). The upregulation of Il36a in caNrf2-tg mice is most likely indirect, because treatment of MIKs with tBHQ induced the expression of this gene only slightly (Fig. 2C), whereas expression of Il36g was strongly upregulated under the same conditions (Fig. 1D). Nrf2 activation in keratinocytes induces expression of IL-36α indirectly. qRT-PCR for Il36a, Il36b, Il36ra, and Il36r relative to Gapdh using epidermal RNA from K5cre (tg/wt) and K5cre-caNrf2 (tg/tg) mice (A) or K5cre (tg/wt) and K5cre-CMVcaNrf2 (tg/tg) mice (B) at the age of 8 wk (n = 4–6). **p = 0.0087. (C) Expression of the same genes in MIKs from wt mice treated with vehicle or 50 μM tBHQ. (D–G) qRT-PCR for Il1b, Il36a, Il36g, and Nqo1 relative to Gapdh using epidermal RNA from control (tg/wt) and K5cre-caNrf2 (tg/tg) mice (both untreated or treated three times with TPA) at the age of 8 wk (n = 4–6). **p = 0.0095 (Il1b, Nqo1 untr. ), **p = 0.0022 (Nqo1 3×TPA). (H) qRT-PCR for Il36a, Il36b, Il36g, Il36ra, and Il36r using RNA from MIKs treated with vehicle or 5.8 nM IL-36γ (n = 4). **p = 0.0294 (Il36a), **p = 0.0286 (Il36g). (I) qRT-PCR for Il36a and Il36g using epidermal RNA from MIKs treated with vehicle or 5.8 nM IL-36α (n = 4–6). **p = 0.0095 (Il36a), **p = 0.0022 (Il36g). (J) Working model showing the regulation network of Nrf2, IL-36γ, and IL-36α in keratinocytes. Mean values of control samples were set to 1. To determine whether the increase in Il36a in K5cre-CMVcaNrf2–tg mice is the consequence of the inflammation that develops in their skin (4), we topically treated control and K5cre-caNrf2 mice, once a week for 3 wk, with the phorbol ester 12-O-tetradecanoylphorbol-13-acetate (TPA) and analyzed expression of IL-36 family members 24 h after the last treatment. Concomitant with the strong inflammatory response, there was a dramatic increase in Il1b and Il36a expression, whereas the effect of TPA on Il36g expression was negligible (Fig. 2D–G). Even under these conditions, Il36a was mildly upregulated in K5cre-caNrf2 mice, concomitant with a strong increase in Il36g and Nqo1 (Fig. 2D–G). This coregulation suggested that IL-36γ induces expression of Il36a. Indeed, treatment of murine keratinocytes with rIL-36γ protein resulted in upregulation of Il36a, as well as of Il36g itself (Fig. 2H). Treatment of murine keratinocytes with IL-36α also induced the expression of Il36a and Il36g (Fig. 2I). This regulation is likely to be Nrf2 independent, because IL-36α and IL-36γ did not affect the expression of Nrf2 or its targets Nqo1 and Gsta3 (Supplemental Fig. 3F, 3G). Taken together, these results demonstrate that Nrf2 activation directly induces Il36g expression, which, in turn, induces expression of Il36a in keratinocytes. IL-36α and IL-36γ have auto- and cross-regulatory functions and, thereby, promote their own and each other’s expression (Fig. 2J). To determine whether the increase in Il36a and Il36g expression in response to Nrf2 activation is functionally relevant, we treated MIKs from wt mice with IL-36α or IL-36γ. Surprisingly, IL-36γ stimulated proliferation of these cells, as revealed by incorporation of BrdU, whereas IL-36α had no effect (Fig. 3A–C). Nevertheless, cultured keratinocytes from K5cre-CMVcaNrf2 mice proliferate normally (4). Therefore, the IL-36γ that is produced in response to Nrf2 activation in keratinocytes is insufficient to cause hyperproliferation of these cells, most likely as a result of the strong dilution of the cytokine in the culture medium and/or the inefficient secretion of this cytokine by cultured keratinocytes, which only occurs in the presence of extracellular ATP (20). However, IL-36α and IL-36γ may also stimulate keratinocyte proliferation indirectly in vivo via activation of fibroblasts. Thus, we previously demonstrated a strong upregulation of the keratinocyte mitogens Hgf, Il6, Csf2, and Csf3 in the skin of K5cre-CMVcaNrf2 mice, which is most likely responsible for the increased keratinocyte proliferation and consequent epidermal hyperthickening in these mice (4). Treatment of cultured MEFs with IL-36α or IL-36γ indeed induced the expression of Il6, Csf3, and Csf2, but not Hgf (Fig. 3D–G). These results suggest that Nrf2-mediated upregulation of IL-36γ and the subsequent induction of IL-36α induce the expression of keratinocyte mitogens in fibroblasts, which, in turn, stimulate keratinocyte proliferation in a paracrine manner (Fig. 3H). IL-36γ stimulates keratinocyte proliferation in an autocrine and paracrine manner. (A) Immunofluorescence staining for BrdU (green) and propidium iodide (red) using MIKs treated with vehicle or IL-36γ. Percentage of BrdU+ cells among all cells after treatment of MIKs with vehicle or 5.8 nM rIL-36γ (B) or 5.8 nM rIL-36α (C) (n = 4–12). *p = 0.0286. qRT-PCR of Hgf, Il6, and Csf3 using RNA from MEFs treated with vehicle or 5.8 nM IL-36γ (D) or 5.8 nM IL-36α (E) (n = 4–6). *p = 0.0286, **p = 0.0022. (F and G) RT-PCR for Csf2 and Gapdh using the same RNA samples (n = 4). (H) Working model showing the regulation of IL-36γ and IL-36α by Nrf2 in keratinocytes and their effect on keratinocyte proliferation. Expression levels in control samples were set to 1. Scale bar (in A), 50 μm. Finally, we determined whether induction of Il36g expression is skin specific or a general feature of activated Nrf2. For this purpose, we analyzed expression of Il36g in mouse liver after PH. qRT-PCR analysis revealed an increase in Il36g expression at 6, 24, and 48 h after PH when the inflammation, followed by the peak of hepatocyte proliferation, reaches its maximum (21) (Fig. 4A). Binding of endogenous Nrf2 to ARE1 and ARE2 of the Il36g promoter/enhancer region was detected in the liver within 24 h after PH, but not in noninjured liver (Fig. 4B), suggesting that Nrf2 contributes to the increased expression of Il36g in the regenerating liver. This coincided with an increase in binding of Nrf2 to the Nqo1 ARE (Fig. 4B). However, Il36g expression was not affected in the injured liver of Nrf2ko mice compared with wt controls, suggesting that other factors can compensate for the lack of Nrf2 in these mice and induce Il36g expression in the regenerating liver (Fig. 4C–E). In contrast, caNrf2 expression in hepatocytes (Albcre-caNrf2 mice) (7) further promoted the expression of Il36g in normal and regenerating liver, as revealed by microarray analysis (Supplemental Table I) and qRT-PCR (Fig. 4F). These results demonstrate that Il36g is also a direct target of Nrf2 in hepatocytes and that activation of Nrf2 in the liver promotes expression of this proinflammatory cytokine. Il36g is a direct Nrf2 target gene in the liver. (A) qRT-PCR of Il36g relative to 18s-rRNA using RNA from noninjured and injured (PH) liver of Alb-Cre control mice (n = 3–5). *p = 0.0159. (B) ChIP showing binding of Nrf2 to the AREs of the Il36g and Nqo1 gene promoters in normal liver of wt mice and 24 h after PH (n = 2–4). *p = 0.0286. qRT-PCR for Il36g (C), Nqo1 (D), and Gsta3 (E) using RNA isolated from liver of wt or Nrf2ko mice (n = 2 pools of three mice/genotype). Values obtained for each pool are indicated (□). (F) qRT-PCR of Il36g using RNA from noninjured and injured (PH) liver of Alb-Cre (tg/wt) [see also (A)] and Albcre-CMVcaNrf2 (tg/tg) mice (n = 3–5). Expression levels in noninjured liver of control mice were set to 1. **p = 0.0097, *p = 0.0159. We identified a major proinflammatory cytokine as a novel target of the Nrf2 transcription factor. Furthermore, our in vitro studies provide strong evidence of an important role for the Nrf2–IL-36γ axis in the control of keratinocyte proliferation through a direct effect of the cytokine on keratinocytes and, in particular, through the induction of a double paracrine loop involving dermal fibroblasts. Evidence of Nrf2-dependent regulation of IL-36γ was provided at multiple levels by combining ChIP, mRNA profiling, and a newly established highly specific SRM assay panel that will be instrumental for reliable identification and quantification of this important cytokine in future studies. Our findings shed new light onto the recently identified proinflammatory and promitogenic functions of Nrf2. These are of major medical importance, because Nrf2 activation is considered a powerful strategy for protection of different tissues and organs from various insults and, in particular, for cancer prevention; however, evidence is emerging that activation of Nrf2 also has negative consequences. For example, genetic or pharmacological activation of Nrf2 in keratinocytes caused skin inflammation, hyperkeratosis, and sebaceous gland enlargement (4, 5). Furthermore, various NRF2-activating compounds are skin sensitizers (22, 23), and recent studies suggest that Nrf2 can promote atherosclerosis in mice (24). Finally, activation of NRF2 occurs in different types of human cancers, which promotes proliferation of cancer cells and their survival under stress conditions (2). The Nrf2-mediated upregulation of IL-36γ and the subsequent increase in IL-36α expression observed in this study may well explain some of these unexpected activities. IL-36 cytokines are overexpressed in affected skin of patients with inflammatory skin diseases, including atopic dermatitis and psoriasis (25–28). The functional importance of this upregulation is supported by several recent findings: IL-36γ mediates the alarmin function of the antimicrobial peptide LL37, and it functions as an alarmin that signals pathogen infections (20, 29); injection of IL-36α promotes myeloid cell infiltration and their activation in the skin (30); tg mice overexpressing IL-36α in keratinocytes develop a psoriasis-like phenotype (31); the psoriasiform dermatitis that develops in mice after treatment with imiquimod depends on an IL-36–mediated cross-talk between dendritic cells and keratinocytes (32); and IL-36RA deficiency causes generalized pustular psoriasis in humans (33). Finally, a proinflammatory function of IL-36 cytokines in tissues other than the skin is emerging (34). The potent proinflammatory activity of IL-36 cytokines also provides a possible explanation for the increased proliferation of keratinocytes that occurs in response to these cytokines in vivo (30, 32, 35), because immune cells produce various keratinocyte mitogens (36). In addition, we show in this article that IL-36γ directly stimulates keratinocyte proliferation. Most importantly, IL-36α and IL-36γ induce expression of keratinocyte mitogens in fibroblasts, which are likely to promote keratinocyte proliferation in a paracrine manner. Thus, our results strongly suggest that Nrf2 can mediate autocrine and paracrine growth control of keratinocytes in vivo via IL-36γ. Nrf2-mediated upregulation of IL-36γ also occurred in hepatocytes in vivo. This may contribute to liver regeneration, as suggested by the upregulation of IL-36γ after PH (this study) and in response to treatment with acetaminophen, which also causes liver injury (37). Importantly, treatment of mice with IL-36ra impaired the regeneration of the liver in this toxin-induced injury model, suggesting that IL-36 directly or indirectly promotes proliferation of hepatocytes (37). Our ChIP experiments revealed that Nrf2 binds to AREs in the Il36g gene promoter/enhancer region upon additional activation/stabilization of endogenous Nrf2 or expression of the caNrf2 mutant, resulting in activation of Il36g expression. In quiescent hepatocytes and in keratinocytes, endogenous Nrf2 binding was below the level of detection; however, a significant increase in Nrf2 binding to Il36g AREs occurred in wt mice in response to PH, and this was accompanied by an increase in Il36g expression upon liver injury. 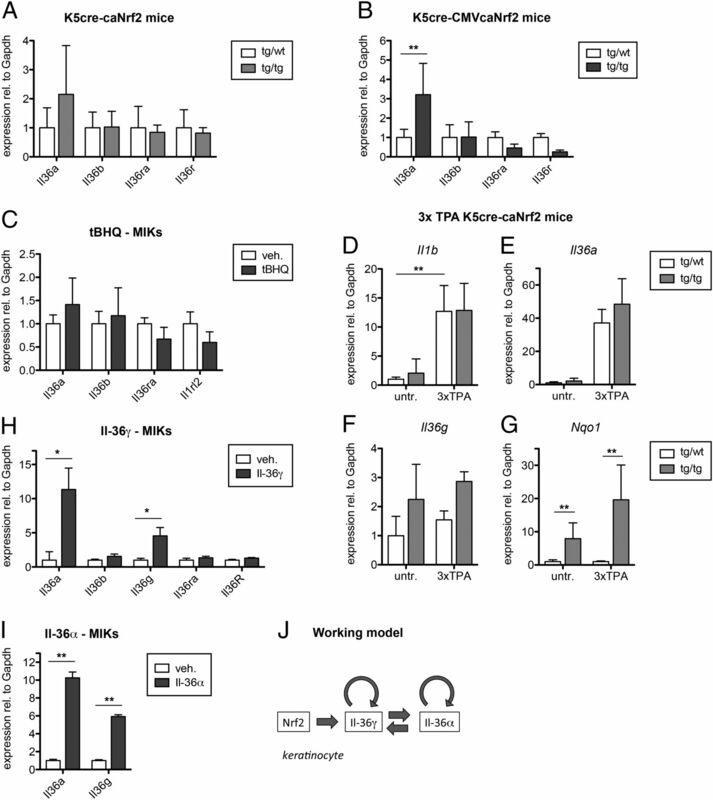 These findings strongly suggest that endogenous Nrf2 contributes to the expression of Il36g in proliferating hepatocytes of wt mice; however, no difference was observed in the expression of Il36g in Nrf2ko mice, suggesting compensation by other transcription factors in Nrf2-deficient mice, which also control expression of the Il36g gene. Our results demonstrate that activation of Il36g expression is a rapid response to Nrf2 activation and likely contributes to the effects of activated Nrf2 on inflammation and cell proliferation. Although this may be beneficial in response to tissue injury, it is likely to promote chronic inflammation and may even contribute to cancer development. Therefore, this new Nrf2–IL-36γ axis needs to be considered when Nrf2-activating compounds are used pharmacologically in patients. In the future, genetic or pharmacological activation of Nrf2 in mice lacking IL-36R will unravel whether and to what extent the upregulation of IL-36γ contributes to the beneficial or detrimental in vivo activities of Nrf2. We thank Hayley Hiebert, Andreas Bapst, and Urs Wegmann (Swiss Federal Institute of Technology [ETH] Zurich) for invaluable experimental help; Dr. Yuet Wai Kan (University of California San Francisco, San Francisco, CA) for Nrf2-knockout mice; Dr. Petra Boukamp (German Cancer Research Center, Heidelberg, Germany) for HaCaT cells; and Dr. Paul Hiebert and Beat Siegenthaler (Swiss Federal Institute of Technology [ETH] Zurich) for MEFs and MIKs. S.M. is a member of the Ph.D. program in Molecular and Translational Biomedicine. This work was supported by the Swiss National Science Foundation (Grant 310030-142884 to S.W.) and by the Gebert-Rüf Foundation (Grant GRS-052/13 to S.W. and M.S.).
. 2010. Stress-activated cap’n’collar transcription factors in aging and human disease. Sci. Signal. 3: re3.
. 2012. Nrf2 redirects glucose and glutamine into anabolic pathways in metabolic reprogramming. Cancer Cell 22: 66–79.
. 2012. Nrf2 links epidermal barrier function with antioxidant defense. EMBO Mol. Med. 4: 364–379.
. 2010. Nrf2 establishes a glutathione-mediated gradient of UVB cytoprotection in the epidermis. Genes Dev. 24: 1045–1058.
. 2014. Activation of Nrf2 in keratinocytes causes chloracne (MADISH)-like skin disease in mice. EMBO Mol. Med. 6: 442–457.
. 2014. Activated Nrf2 impairs liver regeneration in mice by activation of genes involved in cell-cycle control and apoptosis. Hepatology 60: 670–678.
. 1996. 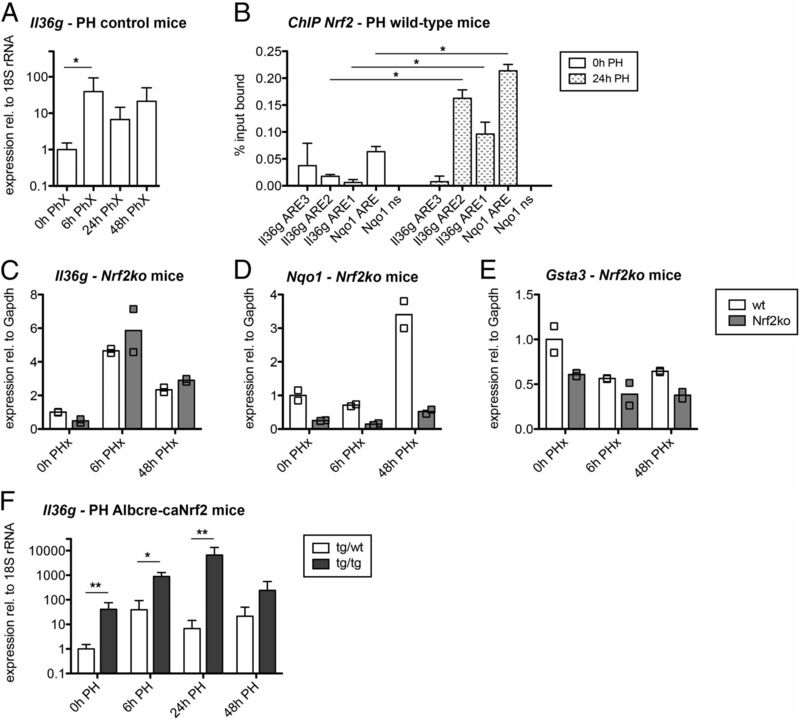 NRF2, a member of the NFE2 family of transcription factors, is not essential for murine erythropoiesis, growth, and development. Proc. Natl. Acad. Sci. USA 93: 13943–13948.
. 2006. Nrf transcription factors in keratinocytes are essential for skin tumor prevention but not for wound healing. Mol. Cell. Biol. 26: 3773–3784.
. 2010. FGF receptors 1 and 2 control chemically induced injury and compound detoxification in regenerating livers of mice. Gastroenterology 139: 1385–1396.
. 2013. Dual role of the antioxidant enzyme peroxiredoxin 6 in skin carcinogenesis. Cancer Res. 73: 3460–3469.
. 2014. A novel Nrf2-miR-29-desmocollin-2 axis regulates desmosome function in keratinocytes. Nat. Commun. 5: 5099.
. 2015. In vivo assessment of protease dynamics in cutaneous wound healing by degradomics analysis of porcine wound exudates. Mol. Cell. Proteomics 14: 354–370.
. 2007. Protocol for micro-purification, enrichment, pre-fractionation and storage of peptides for proteomics using StageTips. Nat. Protoc. 2: 1896–1906.
. 2010. Skyline: an open source document editor for creating and analyzing targeted proteomics experiments. Bioinformatics 26: 966–968.
. 2012. Using iRT, a normalized retention time for more targeted measurement of peptides. Proteomics 12: 1111–1121.
. 2011. mProphet: automated data processing and statistical validation for large-scale SRM experiments. Nat. Methods 8: 430–435.
. 2014. MSstats: an R package for statistical analysis of quantitative mass spectrometry-based proteomic experiments. Bioinformatics 30: 2524–2526.
. 2011. H3K4 tri-methylation provides an epigenetic signature of active enhancers. EMBO J. 30: 4198–4210.
. 2012. The double-stranded RNA analogue polyinosinic-polycytidylic acid induces keratinocyte pyroptosis and release of IL-36γ. J. Invest. Dermatol. 132: 1346–1353.
. 1997. Liver regeneration. Science 276: 60–66.
. 2013. Allergic skin inflammation induced by chemical sensitizers is controlled by the transcription factor Nrf2. Toxicol. Sci. 134: 39–48.
. 2013. Gene expression changes induced by skin sensitizers in the KeratinoSens™ cell line: Discriminating Nrf2-dependent and Nrf2-independent events. Toxicol. In Vitro 27: 2225–2232.
. 2012. Nrf2 in bone marrow-derived cells positively contributes to the advanced stage of atherosclerotic plaque formation. Free Radic. Biol. Med. 53: 2256–2262.
. 2011. IL-1F5, -F6, -F8, and -F9: a novel IL-1 family signaling system that is active in psoriasis and promotes keratinocyte antimicrobial peptide expression. J. Immunol. 186: 2613–2622.
. 2015. RNA sequencing atopic dermatitis transcriptome profiling provides insights into novel disease mechanisms with potential therapeutic implications. J. Allergy Clin. Immunol. 135: 1218–1227.
. 2014. Intraindividual genome expression analysis reveals a specific molecular signature of psoriasis and eczema. Sci. Transl. Med. 6: 244ra90.
. 2015. IL-36γ (IL-1F9) is a biomarker for psoriasis skin lesions. J. Invest. Dermatol. 135: 1025–1032.
. 2014. Alarmin function of cathelicidin antimicrobial peptide LL37 through IL-36γ induction in human epidermal keratinocytes. J. Immunol. 193: 5140–5148.
. 2014. IL-36 promotes myeloid cell infiltration, activation, and inflammatory activity in skin. J. Immunol. 192: 6053–6061.
. 2007. Opposing activities of two novel members of the IL-1 ligand family regulate skin inflammation. J. Exp. Med. 204: 2603–2614.
. 2012. Psoriasiform dermatitis is driven by IL-36-mediated DC-keratinocyte crosstalk. J. Clin. Invest. 122: 3965–3976.
. 2011. Interleukin-36-receptor antagonist deficiency and generalized pustular psoriasis. N. Engl. J. Med. 365: 620–628.
. 2015. Regulation and function of interleukin-36 cytokines in homeostasis and pathological conditions. J. Leukoc. Biol. 97: 645–652.
. 2010. Fibroblast growth factor receptors 1 and 2 in keratinocytes control the epidermal barrier and cutaneous homeostasis. J. Cell Biol. 188: 935–952.
. 2003. Regulation of wound healing by growth factors and cytokines. Physiol. Rev. 83: 835–870.
. 2015. Application of IL-36 receptor antagonist weakens CCL20 expression and impairs recovery in the late phase of murine acetaminophen-induced liver injury. Sci. Rep. 5: 8521.